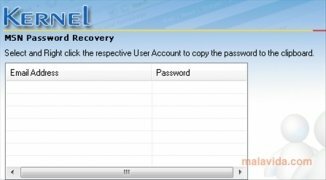 Nucleus Kernel Hotmail MSN Password Recovery is a simple application that will allow you to recover the passwords of your Messenger accounts that you have forgotten . 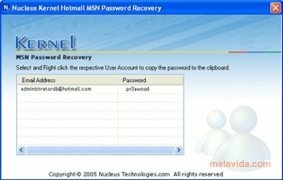 You have surely got several Hotmail email accounts, and it is possible that you may forget the password for one of them. Nucleus Kernel Hotmail MSN Password Recovery is a tool that will help you to recover them. This application is very easy to use, and it does all the work for you. 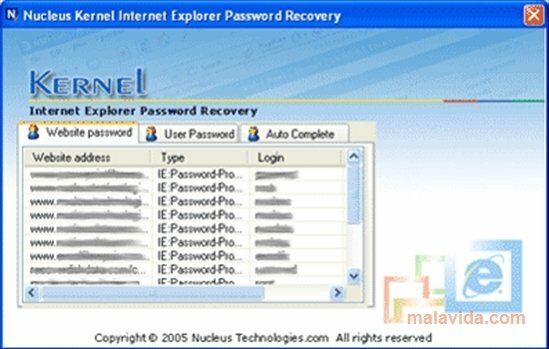 When you launch Nucleus Kernel Hotmail MSN Password Recovery, it automatically detects the email accounts that you use on your computer, and it shows you the password for each of them. 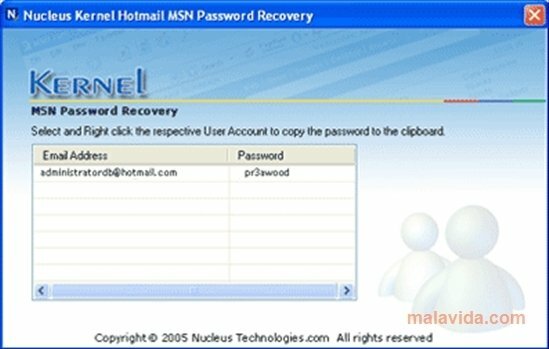 It is important to indicate that Nucleus Kernel Hotmail MSN Password Recovery can't be used to get another person's passwords, it only recovers the keys that have been used on your computer. So as to avoid that your password is stolen, it's important to change it every now and again, but that can cause you to forget it. 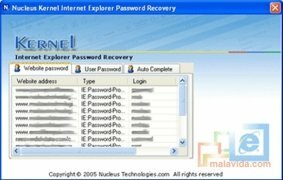 Nucleus Kernel Hotmail MSN Password Recovery is a solution to recover those passwords that you have forgotten.